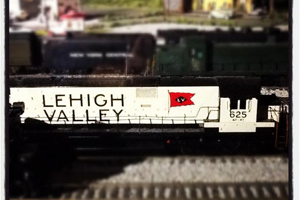 A lot older version of seven-year-old me walked into the Merchants Square Mall at 1901 South 12th St. in Allentown to take a peek at the simply massive new Model Train Exhibit and seven-year-old me walked out with a huge smile. No matter your age, at some point trains were a fascinating point of many people&apos;s lives. Whether it was the little model train that ran beneath your Christmas tree each year or Thomas the Tank Engine or even The Little Engine that Could, trains hold a special place for many people. Part of it has to do with their sheer real-life size. Part of it has to do with the fact that you, too, could recreate a little town of your own with a train that you could control. And, while some people move onto different interests as they age, some continue with their fascination of model trains to create things that bring out the child in all of us. The Model Train Exhibit at Merchants Square Mall has more than 1,000 separate structures, 30,000 illuminating the stars, sky, moon, and buildings; and more than forty model trains rolling continuously on 18,000 feet of track. It even has a working carnival. It even has a working subway. It has a McDonald&apos;s that has cars actively going through the drive through. It has a four-inch deep lake that has a cloud over it that produces thunder and rain. Did I mention it has a four-inch deep lake that has a cloud over it that produces thunder and rain? The Merchants Square Model Train Exhibit was built by Joe Kean, who previously built model train displays at Pocono Museums Unlimited in Lehighton, PA and Hooven Mercantile Company Museum in Jim Thorpe, PA.
Kean and his small volunteer crew of dedicated model train enthusiasts spent more than two years building what Mr Kean calls his masterpiece. It&apos;s impossible to take in the entire depth and breadth of what Kean has created in one visit. The attention to detail, including some stone driveways with pebbles that must have taken hours to get just right, is mind-boggling. The Exhibit features one main area, where the lake is included, as well as two separate "communities" on either end. One features a fully functioning mountain ski area while the other hosts a county fair. Even if you haven&apos;t been interested in model trains in many years, the Merchants Square Mall exhibit is sure to bring back nostalgia. And, for those children who are lucky enough to step inside and marvel at its wonder, it&apos;s sure to instill a creative seed that just may lead to a new hobby for years to come and it just may bring out the child in you. When you go, be sure to notice some of the local flavor Kean has included in this exhibit. See if you can spot the Roxy Theatre, The PPL Building and Becky&apos;s Drive In!